Espionage is constantly evolving. Agents and their handlers are always looking for new ways to outwit the opposition, to beat the odds. Techniques and training, weapons and gadgets - every edge helps when the fate of the world hangs in the balance. Now, declassified and available for the first time in print, the latest and greatest tricks of the trade are yours to command. 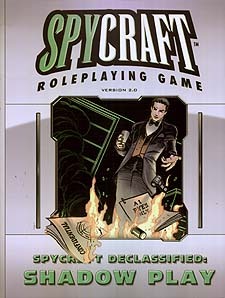 Spycraft Declassified: Shadow Play collects some of the very best in Crafty Games PDFs and Signs & Portents articles, including Agent X classes and feats, cutting-edge weapons and gear from Bag Full of Guns, advanced combat actions and tricks from Practice Makes perfect, alternate gear systems from The Big Score, flexible Attribute-based classes from Back to Basics, and more! Whether you're a player or a Game Control, this is your chance to upgrade your clearance and raise your game to a whole new level.